Can we have a fire in a highly vacuumed environment? The first author, Takuya Yamazaki, a PhD candidate, said, "No one could even consider drilling such a tiny hole into the 2-mm scale of the fragile specimen that we used, and then manually inserting the tiny thermocouple in it. Of course, no one has tried this before since it is clearly extremely difficult, and requires considerable patience and effort. In fact, I must admit, it was really exhausting to complete this task. Nevertheless, this provided us insight on the thermal status near the critical condition to thoroughly understand the extinction mechanism. For instance, combustion heat is first transferred along the axis by radiation, then part of the transferred heat shall be lost to ambient via natural convection when the total pressure is in the order of tens of kilo-pascals. Because the convective heat loss tends to be suppressed when the total pressure decreases, the heat transferred by radiation could remain in the specimen to avoid extinction. This fact has been demonstrated by this work for the first time ever because we are the first group to take on the 'super' challenge of measuring the precise temperature distribution of a smoldering specimen at near extinction." "The present results are opened to the fire society simply owing to Takuya's personal devotion. This outcome suggests that the vacuumed operation to extinguish fire in space may fail unless the proper condition is achieved. Otherwise, smoldering would survive, and it would cause the fire to result in secondary damage to the cabin. This work is just the first step to propose a fire safety strategy (regulation) in outer space habitats to privatize space development", explains Professor Yuji Nakamura. We use the term "smoldering" frequently, but, in reality, no one knows how a specimen burns to generate heat locally. It has been considered that surface oxidation is the source of heat generation, and that gas-phase reaction is not required to be considered. However, based on recent numerical predictions by a Chinese research team (a member of an international collaboration team led by Prof. Nakamura), it was found that a gas-phase gentle heat generation can support or promote surface oxidation. 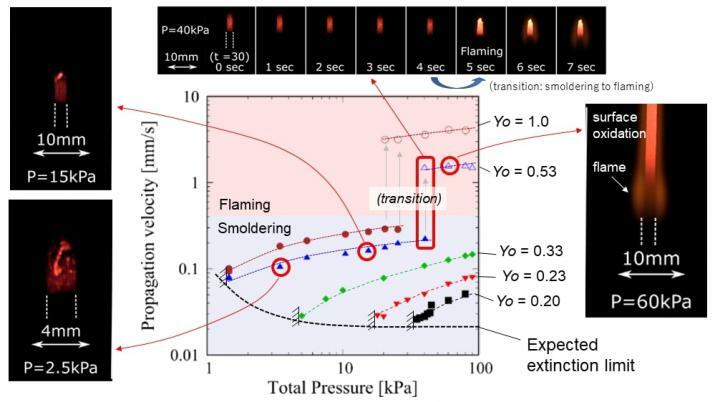 To further the cause of understanding smoldering in low pressures, another international collaboration team in the United States, led by Prof. Nakamura, will assume the challenge to experimentally identify the reactivity in the gas-phase. This is a very important endeavor, because scant attention has been paid to the reaction status of the micro-pores of a burning specimen.